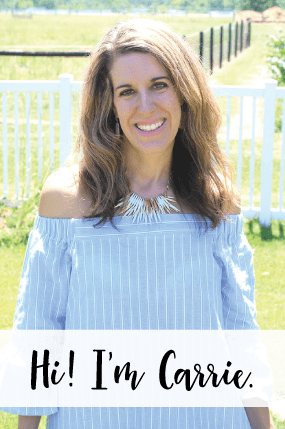 I took Autumn in for her 3 year old well visit a couple of weeks ago, but with all of the holiday busyness, I never had time to blog about it! She is doing really well, I was excited to see that she is more of an average height now, and not SUPER tall (she was in the 81% last year and is now 40%!). Which, is probably why she has thickened out some and is 29 lbs now and was 24 lbs last year this time. She really loves to eat, she has a breakfast before we leave the house in the morning then has another breakfast at my Mom’s after I drop her off. Unfortunately, she still has a heart murmor… but, it doesn’t need to be looked at by a specialist nor does she need antibiotics when she goes to the dentist. Its more of a developmental heart murmor, it will probably go away in a few years as her body continues to grow. 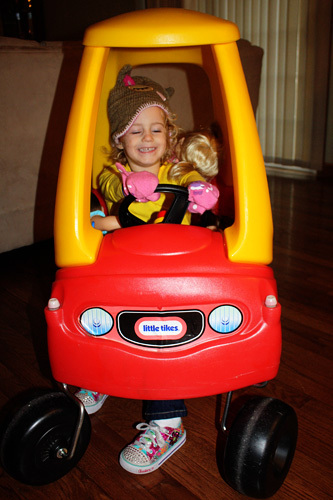 I wanted to post a picture of Autumn’s favorite toy, her red car. Her and her babies go everywhere in the house in this car. It was especially cute today when I took this picture, because she got into the coat closet and put her hat and gloves on like she was driving outside. Ha, ha! A LOT has happened in Autumn’s life in 2011. 3. Autumn got rid of her BINKY! YAY! Yes, number 3 just happened the weekend before Christmas. I decided I had to get rid of the blasted binky once and for all, and I was going to do it COLD TURKEY! Yes, I had the binky fairy swoop in (even after I saw Autumn try to secretly hide a binky under some wash cloths), and binky fairy took all the binkys on her dresser and the binky under the wash cloths. 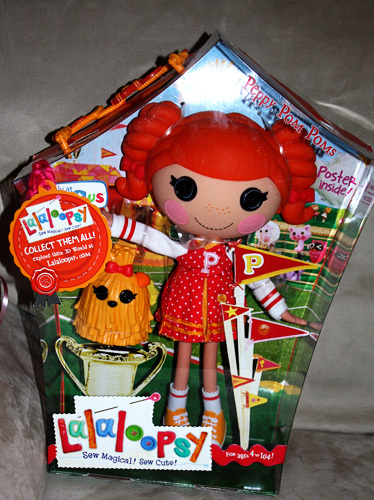 She also left this adorable Lalaloopsy doll (aren’t these dolls heads gigantic?! )… It left for a very fussy Autumn (especially when her hidden binky was taken, too!) and we had a very rough two nights. BUT, the third day was the charm and little Autumn forgot ALLLLL about her binky. Cut to just this last Friday, when I am working on baking cookies and Nathan tells me from the living room that he knocked over my tree. I of course asked him WHICH tree, because the Christmas tree and a decorative tree are in that room. Whew! It was the decorative tree, but in the process a ‘binky’ that had not been taken from Binky Fairy had fallen out and been seen by Miss Autumn. I took that binky and OHHHH it started the flood gates and ‘Beeebeeee!’ (what she calls them) ALL over again for a good hour. But, then she forgot all about it once the cookies were out of the oven and we’ve been happy ever after since then! If I had known it was this easy to get rid of the binky, I would have done it a year ago! Ha, ha! So proud of my little Autumn!